What Happens To Corporate Buybacks During A Recession? US corporates in the S&P 500 Index have repurchased $3.8 trillion of their own stock since 2010. 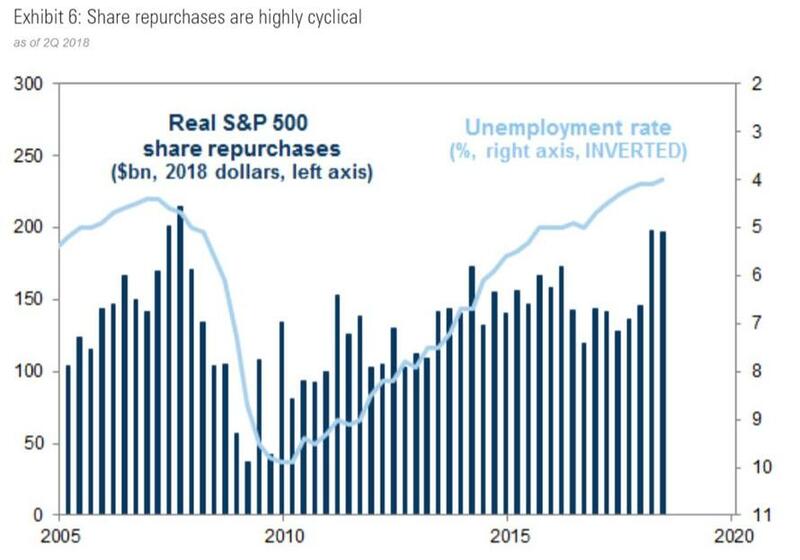 Buybacks for the last 12 months ended June (latest data available) total $646 billion, the largest run rate ever. Buybacks have totaled +$100 billion every quarter since Q2 2013. To put some perspective around these numbers, consider that 2018YTD inflows into US large cap equity ETFs are just $26.5 billion. Now, since buybacks are entirely predicated on corporate earnings and management confidence in the business, we got to wondering “What happens when earnings decline?” Following Sutton’s Law, will the demand for US stocks decline precipitously when earnings drop in a recession or noticeable economic slowdown? Corporate buybacks peaked in the prior cycle at $589 billion (the 4 quarters of 2007). One year later, buybacks had more than doubled to $299 billion for the 4 quarters ending December 2010. Between 2010 and 2017, S&P 500 companies allocated an average of 51% of their operating earnings on buybacks. This year is higher, at 59% through the first half. #1. Buybacks are not signs that “stocks are cheap”. They are a signal from management that profits exceed reinvestment opportunities. The comparison between 2007 and 2009 noted above is all you need to know on this count. #2. Buybacks move in lock step with operating earnings, with some wiggle room for management judgment. Even in 2010, not long after the Financial Crisis, companies were already allocating 43% of operating earnings to buybacks. Now that number is roughly 50-60% with managements feeling generally confident in near term business conditions. #3. 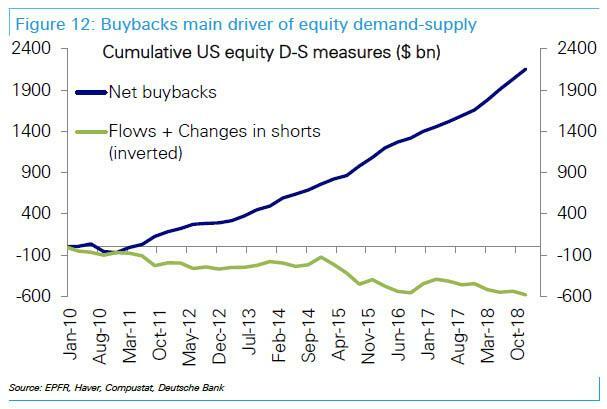 Barring a Financial Crisis-style recession, corporate buybacks will remain a prominent feature of the US equity landscape. Assume, for example, a 30% decline in current corporate earnings from a recession that starts early in 2019. This would take S&P 500 operating earnings from $1,200 billion currently to $840 billion in 2019. Buybacks might drop to 45% (similar to 2010) of that lower earnings number, or $378 billion. Nowhere near their trailing 12 month run rate of $646 billion, to be sure. But more than enough to absorb some of the selling that would come with a recession. There might be a quarter or two of lower buyback/earnings percentages (which would mark a bottom), but once conditions stabilize managements would step back in. The bottom line: yes, buybacks are very important to market dynamics, but no - they won’t go away in a garden-variety recession. Something deeper, like a 2008-2009 rerun, and all bets are off. But if that happens we’ll likely have bigger problems anyway.